In the beginning of the stunning documentary Visions of Light, Do the Right Thing cinematographer Ernest Dickerson recalls watching the black and white 1940’s British classic Oliver Twist and being taken in by the film’s look but his reaction wasn’t articulated until his uncle complimented the film’s impressive photography. Film photography or cinematography is one of the most exquisite art forms involved in the process of moviemaking—the way it heightens themes, punctuates action, lights an actor’s face or dances with shadows can make or break a film, yet the visual way it tells the story is often overlooked in the minds of audience members who usually focus instead on the performances, story or more tangible details. 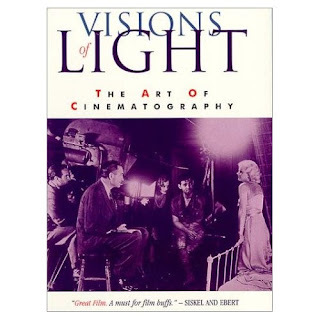 Winner of three Best Documentary awards from critics’ circles in Boston and New York and the auspicious National Society of Film Critics, Visions of Light is a must for film lovers and for those studying the medium in postsecondary education or working in the field professionally. While the early 90’s work is dated and leaves out some of the sweeping and spectacular visuals that have captured the hearts of filmgoers since its release, it provides wonderful history and firsthand accounts from directors of photography in following the evolution of the process from its beginnings in silent pictures that evolved by the way it was elevated in German expressionism, to new technology invented in machine shops by innovative pioneers as they overcame the limitations of the introduction of sound and microphone placement, not to mention its integral role in launching stars in the 30’s up through today. As devotees of 30’s cinema may recall, Greta Garbo had her cinematographer under contract to make sure she was always filmed by him and while the cameramen did have to work within the vanity of the star system, some truly memorable works of creative genius followed, especially in the form of Gone With the Wind until that was overshadowed by the significant release of Citizen Kane. Kane is, as some of the cinematographers interviewed note, a textbook for the job and its impact on the way that Kane still holds up today cannot be diminished; in fact, Welles was so aware of its importance that he shared his title card with cinematographer Gregg Toland. With investigative, if slightly brief looks at film noir and a good segment dealing with the films and cinematographers responsible for groundbreaking works in the 60’s and 70’s in films like The Conformist and cameramen such as Conrad Hall, Gordon Willis, and Haskell Wexler, it’s a riveting documentary sure to inspire film fans to start watching the movies they love with a new frame of reference and seek out the way that the photography plays an invaluable role in the film’s execution of storytelling.